Our new addition to the office! 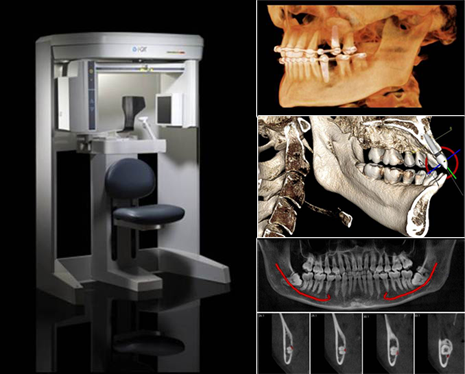 The Gendex CT Scan is a 3D Cone Beam scan that creates a three-dimensional image of a patient’s head, providing a series of high resolution digital images of their maxillofacial area. The Cone Beam scan is the most thorough and accurate image available today. High-resolution, digitally-enhanced pictures pro-vide many layers of information that can be separated to view every aspect of a patient’s mouth, face and jaws. Cone Beam imaging converts a series of conventional low-dose x-rays into high resolution images by managing information through highly sophisticated software. The software creates a digital model of a patient’s oral cavity that can be viewed on a monitor, rotating the image from an infinite selection of angles. Once the scan is captured in the computer, the software will calculate exact measurements of every element of the facial structure. The scan takes less than a minute and is painless. From a 360° scan of the jaw and mouth, these images will aid in choosing the most precise treatment plan for a patient.